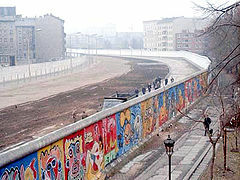 The Berlin Wall constructed in 1961 divided East Berlin (a socialist state) from West Berlin (a federal republic) and did not come down until 1989. For those 28 years the Wall and its towers and armed guards prevented the mass defection from the communist East Bloc to the free west during the cold war. Families, friends, and lovers were split apart. One hundred people (a disputed number) who attempted to escape East Berlin were killed by East Bloc guards—shot down in the no-man’s zone between east and west. Ada, 15, is a graffiti artist squatting with her broken mother, Mutti, and grandmother, Omi, in a small damp flat in free West Berlin while Stefan lives with his grandmother, grossmutter, in depressed gray East Berlin. Ada has visited East Berlin four times a year since she was little with Omi who is best friends with Stefan’s grandmother. At twelve years old Ada fell in love with Stefan, 14. Stefan’s mother was stranded in the West when the wall went up. She never looked back. When Stefan was still quite young, his grandfather attempted escape to find his daughter and was never seen again. The Stassi—secret police—sent grossmutter an empty coffin. But his grandfather gave Stefan a telescope and hope before he’d left. Ada works at a pre-school, caring for Turkish children, whose families the Germans have brought in as cheap labor. At night Ada graphs at the edge of the no-man zone, risking her life, making art and sending messages to Stefan that he cannot even view with his telescope. Pink-haired headstrong Ada, who can visit the East and return west to a limited degree loves Stefan but says she will not wait forever. She urges him to escape. Stefan loves bright rebellious Ada, but he fears being shot. A subplot involving Ada’s favorite Turkish pre-schooler, Savas, and his abused mother brings out an aspect of the story of Berlin of which I knew nothing. In fact I’ve read no other fiction involving this dramatic historic era and place. The relationship of the grandmothers gives us a view of young adults in war time Berlin, countering the punk history of the two protagonists. The end matter includes diverse references for further study. 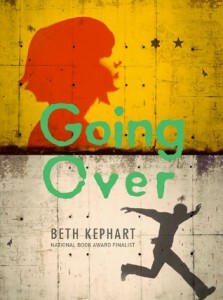 Kephart, a former National Book Award Finalist, writes in heavily figurative language—almost always alluring—in this book about freedom and love. Patricia Hruby Powell’s new book Josephine: The Dazzling Life of Josephine Baker won a Boston Globe Horn Book 2014 Honor for Nonfiction and a Parents Choice Gold Award for Poetry. Another interesting book. Intriguing review. Thanks for piquing my curiosity.